The Age of Enlightenment began in Western Civilization in the early 18h century with the words of Rene Descartes declaring, “I think, therefore I am.” The ideal put forth was one of pure reason as the pathway to truth. Superstition was to be left behind in favor of “rational” thought. A lot of great things emerged from the Age of Enlightenment: Science, for example, and in particular the advances in medicine. Credit is due as well for the establishment of democracies. And yet, there was a certain self-deceit in the Enlightenment, which is to say an inability to acknowledge the limits of reason, and in particular the fact that even as we aspire to be reasonable people, generally speaking we aren’t as reasonable as we would like to think we are. This is a truth the Bible has pointed to for thousands of years, but recently social Scientists have been calling attention to it as well. We like to think that we have solid reasons for the opinions we hold about life. But more often than not our opinions come not through a process of rational thought but rather from osmosis – absorbing them from the people with whom we live. And our opinions have more to do with unconscious, emotional responses to things rather than a clear-headed analysis of facts. Our opinions emerge, and then without acknowledging what we are doing we work backwards — finding reasons to support what we have already concluded to be true. Generally speaking, there are no shortage of reasons to come up with to back up our opinions. We convince ourselves that our point of view is rational, and that everybody who doesn’t agree with us is irrational. But their opinions are also supported by an ever-expanding structure of “reasons.” And this is why, social scientists tell us, the arguments we get into over political beliefs and such tend to go nowhere. Judas is a mysterious figure in the Scriptures. What motivated him to betray Jesus? We really can’t say for sure. In the story we heard this morning Judas lashes out at Mary. Why does Judas do this? His stated reason seems quite logical. Mary’s use of this very expensive ointment is a waste of resources. It should have been sold and the money used to help the poor. What Judas says seems altogether reasonable and what Mary has done altogether unreasonable. But the Gospel writer lets us know that this isn’t his real reason for his attack. His concern for the poor is insincere. Nonetheless, Judas reaches for this argument because he knows it’s a good one – one in line with the values Jesus has promoted. Consistently Jesus has told them to care for the poor. Maybe he is jealous of this inner freedom that Mary possesses that allows her to express herself so spontaneously. And perhaps he is frustrated because he can see the handwriting on the wall that Jesus isn’t going to be who he wants Jesus to be, the military leader who will drive out the Romans. But this much is true: Mary understands things Judas with his well-constructed argument is clueless about. There is reason in this particular era where facts don’t seem to matter to wish we could all develop our capacity to think more critically, but there is no denying the fact we aren’t Mr. Spock from Star Trek. The truth is we are largely led by our feelings, our passions, and what is needed is a greater awareness of these powers that drive us, and the discernment to choose which of these we will nurture within us. There are others ways of “knowing things” than that which comes through rational thinking, a truth readily recognized before the Age of Enlightenment took hold, and one still recognized in parts of the world not dominated by its values. Often these ways of knowing are referred to as “intuition”, of “emotional intelligence” and once again science has been helpful here, in this case the neuro-science that reveals the reality of intuitive knowledge. There are parts of our brain that can pick up on things that our so-called rational brain overlooks. This is one of the assumptions of our faith, that there is this undercurrent of wisdom flowing through the depths of life. Often it is called the “Holy Spirit.” As Jesus says elsewhere in John’s Gospel, the Spirit is like the wind, and as such we do not control it. We cannot arrogantly command either the Spirit or the wind to show up when we want something. This wisdom is the inspiration of all great artwork. To be a master at any art, a rational process of learning the craft is required. A musician must engage in the repetitive work of practicing scales, etc. to develop competency. Mr. Handel didn’t compose his “Messiah” by charting out the algorithms of sound wave frequencies. The Spirit took possession of him – flowed through him – a frenzy of creativity in which the composition was finished in 24 days. But the wisdom of the Spirit is not restricted to great artists – it is available to all of us. It requires humility, an inner openness, an ability to quiet the noise of our thoughts which tend to flow through the same well-worn synapses in our brain. Generally speaking, but not always, women tend to have greater access to intuitive knowledge. My wife intuits things to which I can be oblivious. In the family that was hosting Jesus that night, Mary has it in spades — Martha not so much. Mary’s capacity is related to what we know about her from another story. Unlike her sister Mary could quiet herself inwardly and listen deeply. In that other story Mary sat quietly at Jesus’ feet in the posture of a disciple, listening to him teach. Clearly, Jesus accepted her as a disciple worthy of instruction. Sometimes this Spirit will give us nudges to go to someone who is in a particular state of need that may not be apparent on the surface – sending us to be God’s love for this person. Sometimes the Spirit will lead us to name the elephant in the room that has otherwise gone unacknowledged. The mood at that dinner party that Martha was running was probably festive. There was reason to celebrate: just a couple of days ago Lazarus had been dead and buried in a tomb. Now, thanks to Jesus he is alive, and here he is lounging with Jesus. But Jesus knows that a few days from now he will be nailed to a cross. There must have been a heaviness of heart to him. Apparently this was a family of some financial means, and at some point in the past, Mary had felt this nudge to purchase a particularly costly perfume. I suspect it was out of character for her, and she wasn’t sure why she had felt the need to spend all this money. She just knew it was necessary. She stored the perfume away, waiting. So here at this dinner party Mary senses Jesus’ need. She feels an overwhelming love for him. She feels this internal nudge to go get that perfume. This is the moment for which she has been waiting. 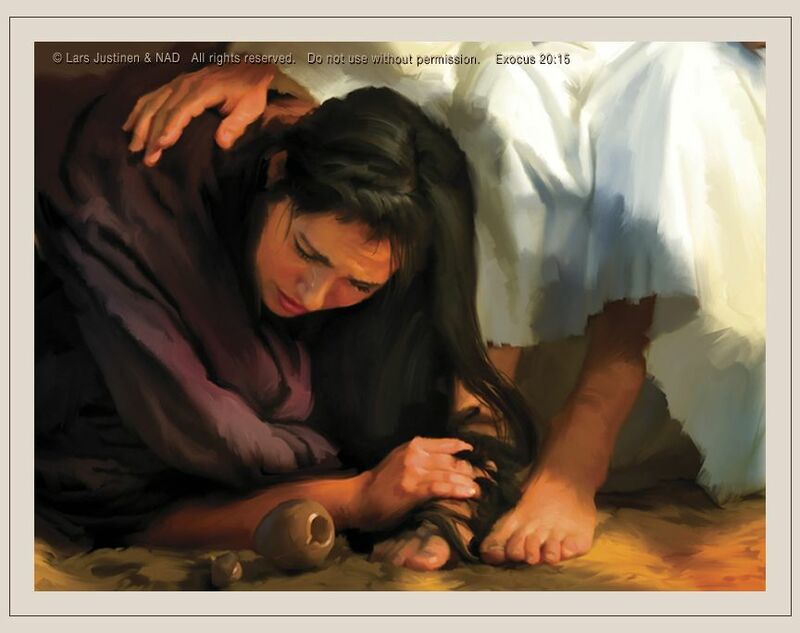 Mary kneels at Jesus feet and begins anointing his feet. Perhaps tears welled up in Jesus’ eyes, moved by this extraordinary act of tender caring. Her act is a kind of artistry – the sweet fragrance that fills the room a sign of God’s love present even as death approaches. A couple of days later, in that upper room in which Jesus gathered for a last meal with his disciples the night before he died, Jesus gave his disciples some final instructions. I suspect Mary was there. One of the central themes of his teaching was the availability of this source of wisdom, the Holy Spirit. God will send it to you in my name, and it will teach you all things and remind you of everything I have said to you. It will bring you peace when the world seems to be falling apart. It will calm you when you feel afraid. Trust me in this. Unfortunately, sometimes our lives need to be broken open for us to be ready to be led by the Spirit – like an alcoholic ready to be led by the higher power. And in the days that followed, all of Jesus’ followers would be broken open. The meal that we are about to share reminds us of that night, and the breaking of Jesus’ body that would shortly follow, and the breaking open of the lives of those of us who would follow him, and the presence of a great holy love in that brokenness. This Spirit, this wisdom is available to all of us.